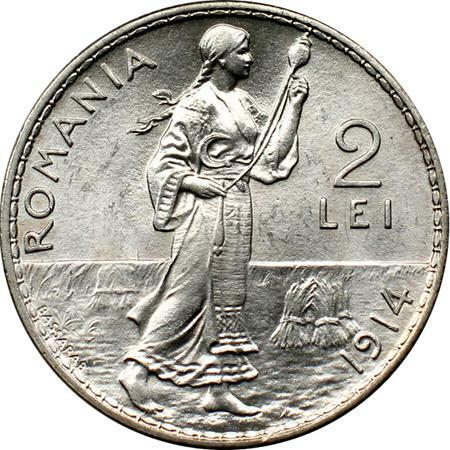 denomination "2 LEI", ROMANIA, year 1910, and spinster woman holding spindle and spinning yarn, with distaff and sickle in her belt; at lower left BASSARAB, along the rim (ensign of engraver Costache Bassarab) inscription "CAROL·I·REGE· ·AL·ROMANIEI" meaning "KING OF ROMANIA" and CAROL I head facing left. Under the neck lies TASSET, the engraver's name. 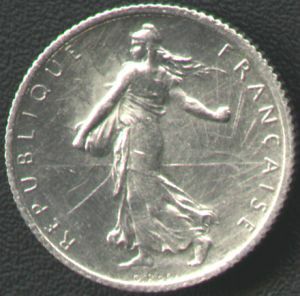 The effigy of king Carol I on the coin series of 1910-1914 was engraved by the French artist Ernest Paulin Tasset (1839-1919). These coins were mainly struck with silver from older used coins that were melted down (especially coins of 5 lei, 5 millions of such coins having been melted down; total face value of coins thus melted: 28.280.000 lei - information provided by Mr. J. M.). 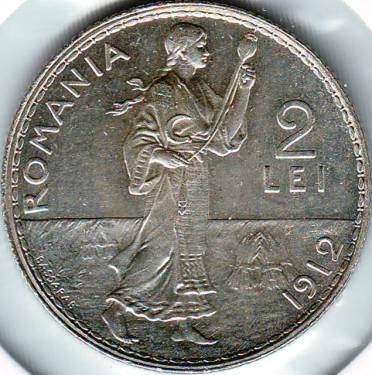 In the book Monetele României (Coins of Romania, Iliescu and Radovici, 2004) it is mentioned that some of the 1 leu and 2 lei 1914 were struck in 1915, at Hamburg (Belgium's capital city had been occupied by the Germans in August 1914, shortly after the outbreak of World War I). In the book Istoria politicei noastre monetare şi a Băncii Naţionale 1880-1914, written by C.I. Băicoianu (History of Our Monetary Policy and of the National Bank 1880-1914, Bucharest, 1932), it is mentioned that in 1915 1.300.000 pieces of 1 leu and 691.734 pieces of 2 lei were struck. The coins struck at Brussels have the teeth on the edge with straight corners. The coins struck at Hamburg have teeth with round corners. The identification of the mint can be also done by counting the number of teeth on the edge of the coins. In 1914 coins were struck with 120 teeth (in Hamburg) and with 124 teeth (in Brussels). 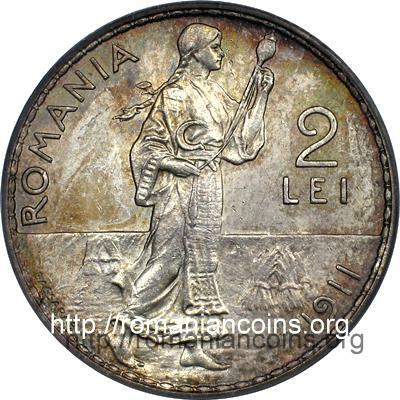 The pictures of 2 lei coins above appear on the site thanks to the kind permission of Mr Cristian Ciuplea. 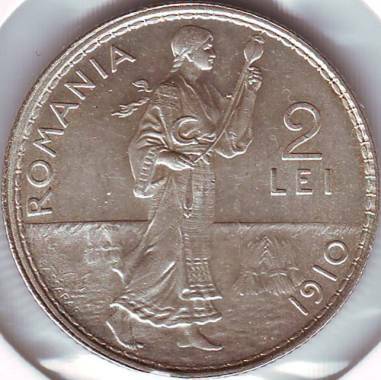 The pictures of 2 lei 1911 and 1914 coins below are present on Romanian coins through the kind permission of an anonymous donor. The Latin Monetary Union did not only mean common values for the coin series, (almost) common exchange rates, alike diameters, titles and weights for the entire coinage of its members or of the countries that used its coin types. 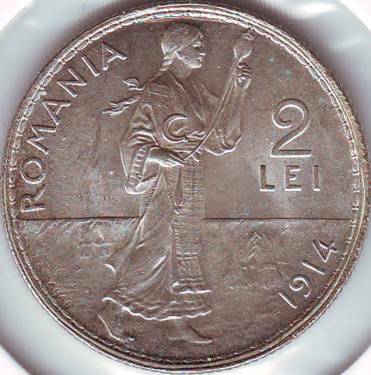 It often meant common themes for the mintage products, as proven by the pictures of the Romanian 2 lei coin struck in 1914 and of the French 1 franc from 1915. Notice the woman, the rustic attire, the horizon line, the bare feet, even the same incuse fashion of stamping the engraver's name (O. Roty in the case of the French engraver). 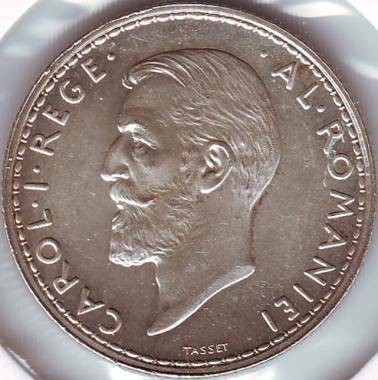 Please also notice the netly superior design of the Romanian coin, which happens to be among the most beautiful. 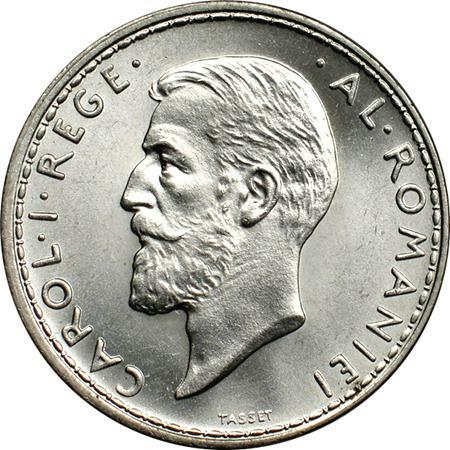 In spite of the fact that Romania was never a member of the Latin Monetary Union, it used the Union's coin types. So, Romania is among the European countries that a long time ago fought for a common currency on the continent and subsequently the leu must be accounted among the precursors of euro. 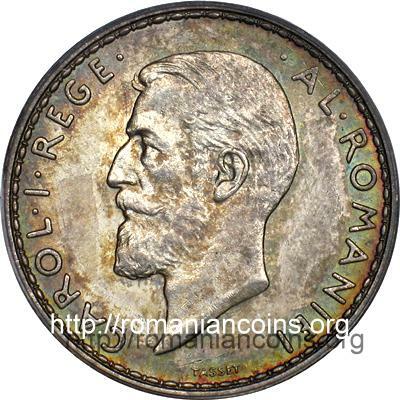 The adoption of Latin Monetary Union coin types influenced the Romanians in various domains and over many facts of their lives. The word franc is even now a synonym of leu, and that is because the leu and its other brethren currencies were rated almost identically for so long. Today this meaning is less used, however I remember my grandfather used to say, not so seldom, sentences like: "It's worth five hundred francs." or "I ran out of francs.". Francs had then yet another, larger signification, of money in Romanian, just like parale - the plural for the name of a small Turkish coin that circulated in the Principalities in the 19th century: para.